While "Pyaz" is the generic word in Hindi for Onions, in today's recipe we specifically use Baby Onions. These are known to be flavourful and less pungent than the conventional onions. 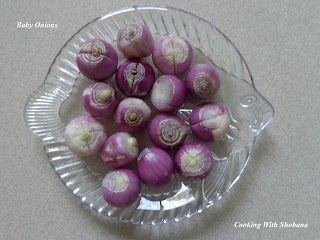 They are used in South India for making sambar etc and are also called "Sambar Onions". You will find them used in many recipes from both Tamilnadu and Kerala. 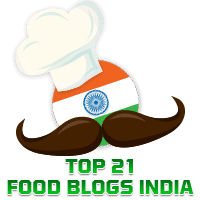 Elsewhere in this blog you will find other dishes using baby onions such as Vendhaya Keerai Sambar, Chinna Vengaya Sambar, and Ulli Theeyal. We are used to peeling the baby onions but in today's world of everyday conveniences, you can get ready to use peeled baby onions in the departmental stores! 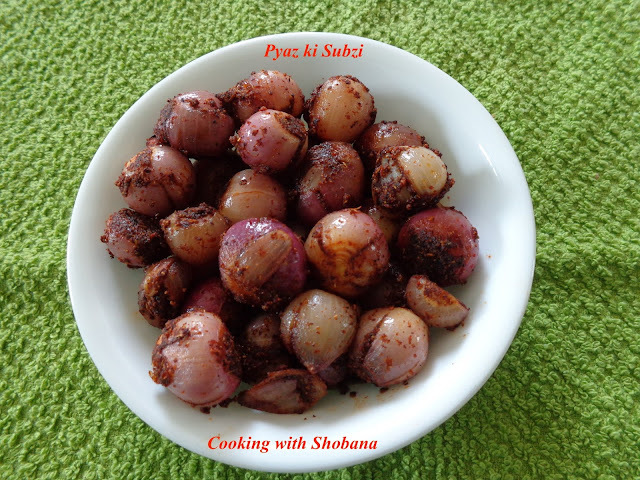 This aromatic side dish from Rajasthan can be served with both rice and rotis. It is adapted from Pyaz ki Subzi by the legendary Tarlaji Dalal. To peel the baby onions, place them in boiling water for 2-3 minutes then drain and transfer them to a bowl of cold water. Cut off the roots and press the baby onions lightly to remove the skin. Carefully cut the baby onions into four without breaking them. Stuff the prepared masala in each of the baby onions using these slits.